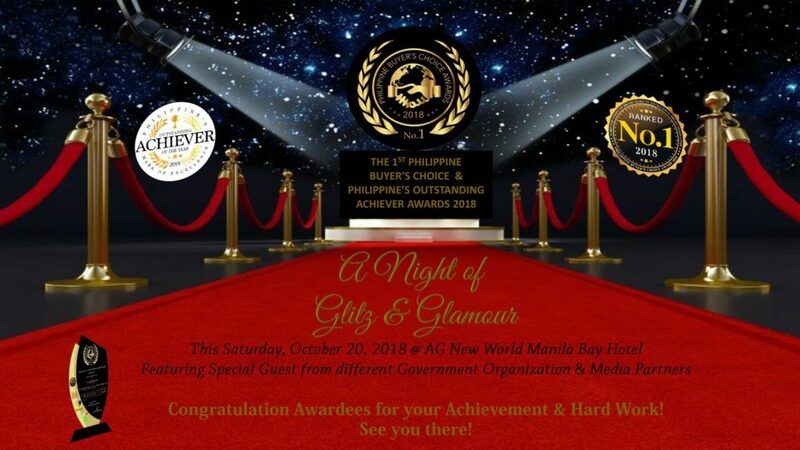 Red Cloud Interactive Marketing Services is selected from nominees of the 1st Philippine Buyers’ Choice Awards to receive an award during the launching of the award-giving body on October 20, 2018, at AG New World Hotel. Red Cloud is awarded as “No. 1 Events Management and Social Media Marketing Provider for Metro Manila.” This award is a culmination and result of the hard work put together by all the volunteers and staff during our many pop culture events. 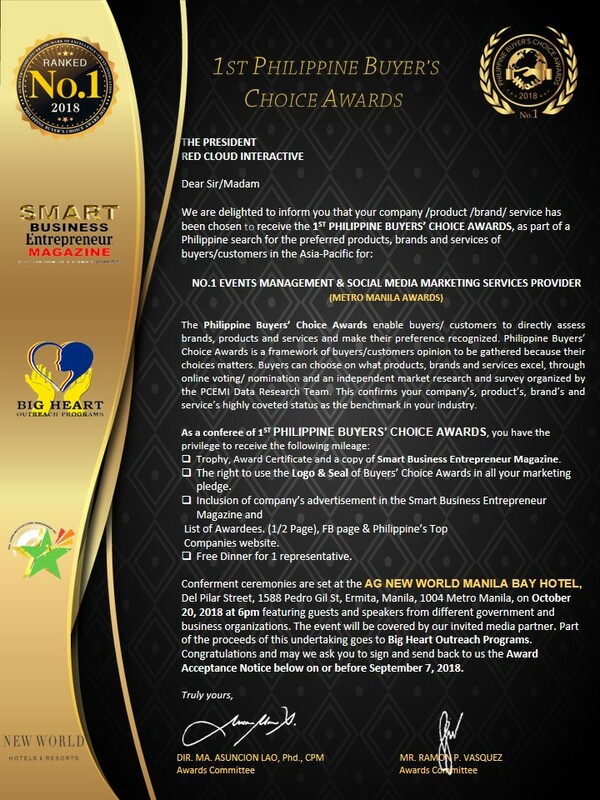 What is the 1st Philippine Buyers’ Choice Awards? 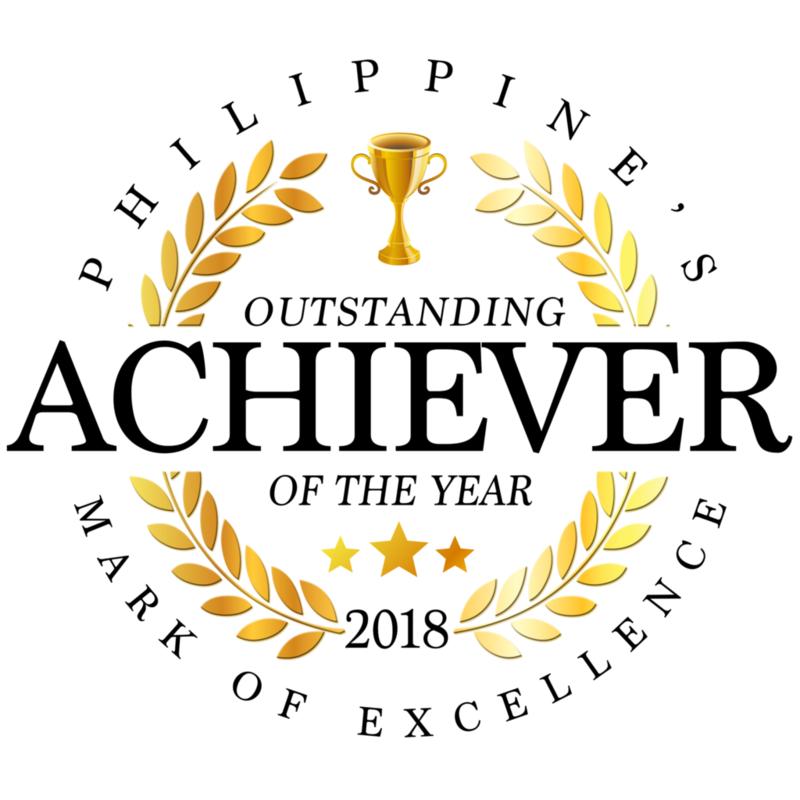 The Philippine Buyers’ Choice Awards & Philippine’s Outstanding Achievers was launched to recognize the prestige of outstanding companies, services, and achievers all over the country. This confirms your highly coveted status as the gauge in your respective industry. It is developed to promote the core principles of Standard of Excellence. This is intended at recognizing Talent, Crafts, Service, and Excellence, Ambition and Aspiration and Good Customer Service as a core for the competitive edge in your respective industries that are ranked by consumers and industry-experts and providing them with the marketing tools to increase productivity and boost their efficiency and lead it through the demanding, yet rewarding, road of success and excellence. Product/Service Quality. The company/products/brands/services must have the best quality and durability. Innovative Marketing and Business Practice. The company must be successful in their innovations which are in line with their respective category and industry. They must have a competitive and dynamic marketing campaign that will create awareness to customers. Public Awareness and Opinion. The company/products/brands/services must have its brand or service recall to customers. It can easily be recognized and their existence must be known to the public and its availability must be ready in the marketplace. Also to give recognition to those individuals, companies, brands, products and services who have done their best to win the heart of the public and consumers by giving quality products, brands, and services. Also to impart public awareness on best and excellent individuals, companies, products, and services and that this recognition serves as inspiration for those individuals, companies, brands, products and services to strive more in achieving excellence and recognition like this and they are worthy of this significant achievement. The selection process is based on the nominations, opinions and evaluation given by the individuals or local buyers from different industry, category and technology. An extensive Market Research and Busines Survey are conducted by the Philcom Data Research Team. A systematic and efficient procedure is applied for the evaluation to determine which companies, products, brands and services emerged as the winner. 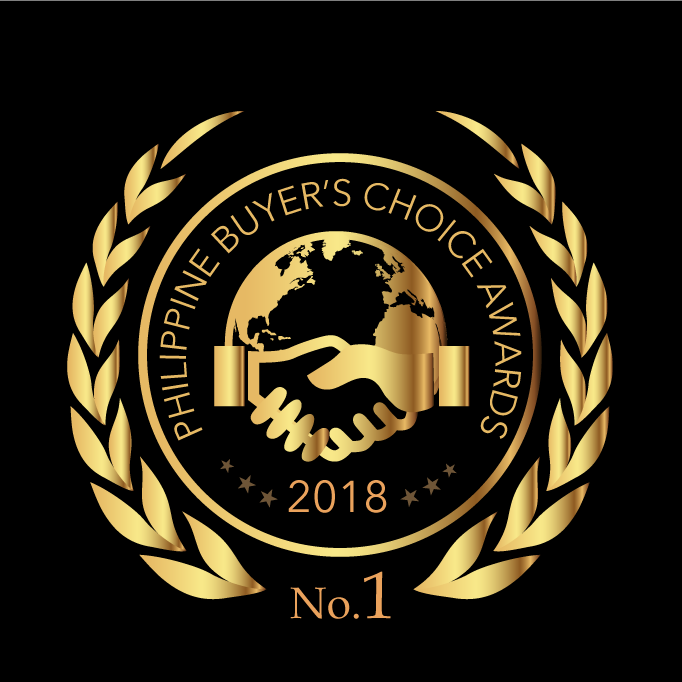 The results were gathered, categorized and established, then the winners are contacted and send invitation informing them that they were chosen as one of the recipients of the Philippine Buyers Choice Award. for a specific category and to verify some information based on accurate statistics. 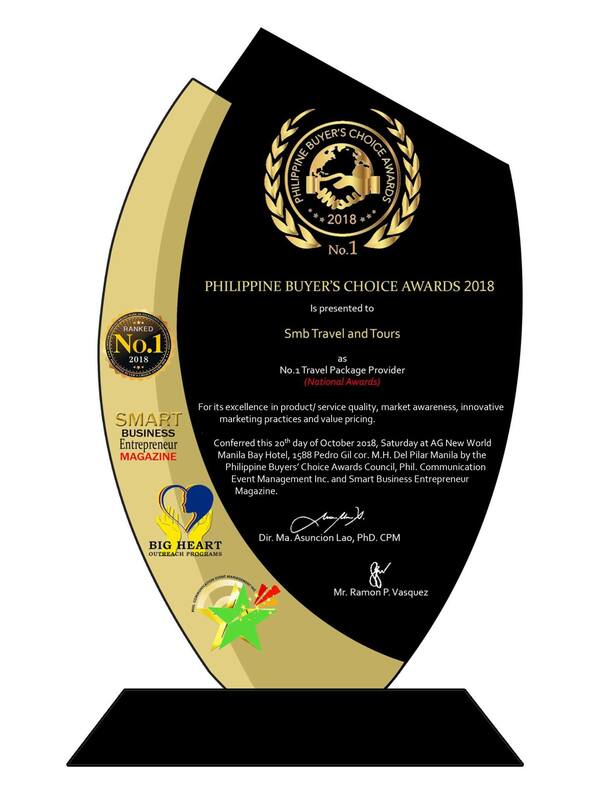 The PHILIPPINE BUYERS’ CHOICE AWARDS “SEAL OF EXCELLENCE” could automatically be used by the companies, products, brands, and services conferred by the Philippine Buyers’ Choice for their marketing materials and campaigns and to recognize their business and market excellence. For more information, you can visit the official Facebook Page. This entry was posted in Company News and tagged awards, recognition. Bookmark the permalink.